The Iranian economy has had its challenges in recent years with the impact of U.S. and E.U. sanctions. Nevertheless, President Hassan Rouhani has continues to foster deeper trade alliances with regional neighbours and Iran is pressing ahead with transport infrastructure improvements to facilitate improved import and export business opportunities. Rouhani is particularly keen to see completion of the construction of the Chabahar-Zahedan-Mashhad railway to complement developments at the port of Chabahar on the Gulf of Oman. Not only is Chabahar seen as the gateway to International markets generally, the railway section going northeast for 1,380 kilometers will connect to regional rail networks to Kazakhstan, Turkmenistan, Afghanistan and beyond. In December, the President attended an inaugural opening of freight train links with Turkmenistan and Kazakhstan and across Central Asia That same month, Rouhani’s delegation travelled to the port city of Chabahar on the east coast of the Sea of Oman to review on-going developments. Construction of the north-south Chabahar-Zahedan-Mashhad railway line is estimated to cost 20 trillion rials (about $570 million), but the international project management openings this offers in return for Iranian businesses is incalculable, which can only benefit the many entrepreneurs in towns and cities throughout Iran. The first 300 kilometer section of the railway from Chabahar to Iranshahr is currently under construction. This together with the Chabahar port development plan is central to economic developments and job creation for both this region and foreign partners who will benefit from this gateway to foreign trade partners, not least India. Chabahar can serve as India's entry point to Afghanistan, Central Asia and beyond. 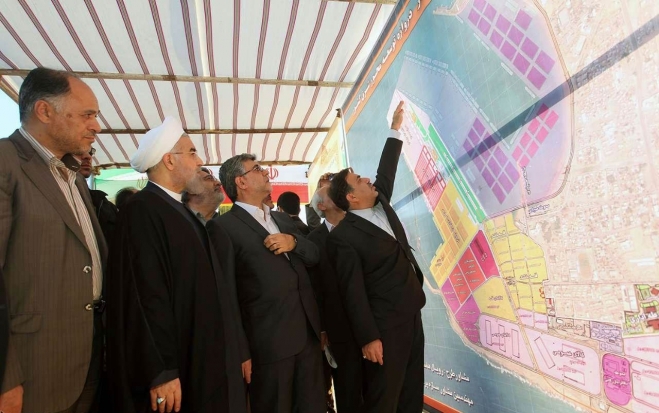 The Chabahar port development plan is estimated to cost 10 trillion rials (about $280 million). It’s completion is expected to increase the port's overseas shipping freight capacity to 8.5 million tons, triple current rates. The development of docks here will mean that ships with up to 80,000 tons of capacity will be able to enter the port. Chabahar is perfectly placed to offer trade partners access to new markets, for instance it is strategically important for countries such as Afghanistan, which is land-locked. Overseas shipping agents and rail freight management companies, such as the White Rose Business Group are set to see its consultancy business expand massively this coming year as a result of Iran’s on-going transport infrastructure investments around the free trade zone of Chabahar port and the expanding rail networks. Altogether, the people of Iran can look forward to increased opportunities and economic development will continue apace from the transport investments.